SEOUL, Oct. 23 (Yonhap) — President Moon Jae-in ratified last month’s summit agreement with North Korean leader Kim Jong-un, as conservative opposition parties cried foul and accused him of failing to seek parliamentary consent. The government decided to ratify the Pyongyang Joint Declaration on its own as the Ministry of Government Legislation concluded that parliamentary consent is not necessary because an earlier, overarching agreement, the Panmunjom Declaration reached at April’s first summit between Moon and Kim, is going through a parliamentary ratification process. The ministry’s point was that last month’s Pyongyang Declaration is designed to carry out April’s Panmunjom Declaration, and parliamentary ratification of the broader agreement would cover all subsidiary agreements. 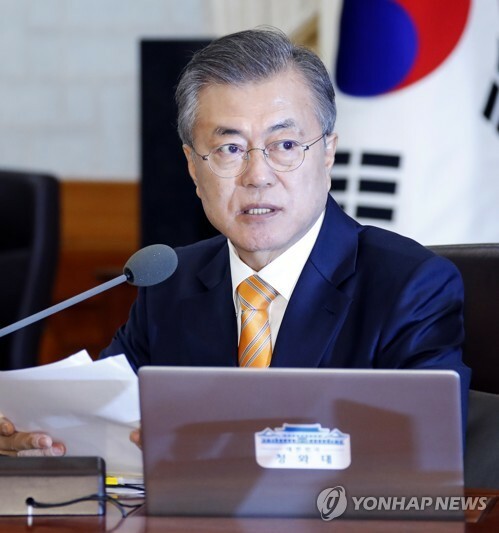 “Improvement in inter-Korean relations and reduction in military tensions will make it easier and facilitate complete denuclearization of the Korean Peninsula,” Moon said during a Cabinet meeting where the summit agreement and a separate inter-Korean military agreement were approved for ratification. April’s Panmunjom Declaration contains a series of broad agreements to halt “all hostile acts” against each other, explore ways to enhance cross-border exchanges and pursue the complete denuclearization of the Korean Peninsula. The Pyongyang Joint Declaration fleshed out the April deal and calls for a series of wide-ranging economic and humanitarian cooperation projects and exchanges between the two sides. It also contains the North’s commitment to take specific steps toward denuclearization. The military agreement calls for ceasing all hostile acts against each other so as to reduce military tensions and prevent accidental clashes, such as suspending all military exercises near the land and sea borders between the two sides. The main opposition Liberty Korea Party protested the government failed to win parliamentary consent. “The (Moon Jae-in) government claims that the Panmunjom Declaration needs parliamentary ratification, but there is no need to ratify the Pyongyang summit and military agreements, key elements (of the April deal). This perception shows how the president is dogmatic,” Kim Sung-tae, the floor leader of the LKP, said. “The government is calling on opposition parties to cooperate, but in reality, it ignores people and the National Assembly,” he added. The minor opposition Bareunmirae Party raised the issue of procedural legitimacy. But the ruling Democratic Party defended the ratification. The government has submitted a motion asking for parliamentary ratification of the April agreement. But opposition parties have been negative about the request, claiming there is no exact cost estimate necessary to carry out the agreement.